I’ve done a fair share of traveling in my time, and a few of the finer outdoor experiences took place in the great state of Montana: Big Sky Country, where the little dipper in the crisp summer night sky gives the impression that it could easily lean down from it’s heavenly perch and jab you right smack in the nose, were it so inclined. Looking skyward from a mountain meadow the universe seemingly presses down on you, smothering and engulfing, turning you into a neo-claustrophobe. But there are riches underfoot, also, in this old mining country. 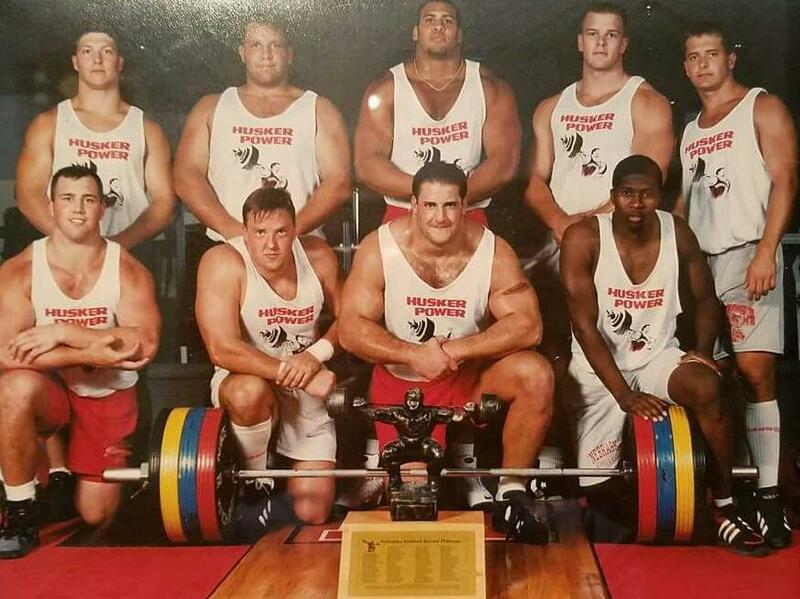 One jewel of a young man who Coach Dan Young gleaned from the copper-heavy Montana ore went by the name of Mark Gilman. Embracing the pressure, the urgency, the once-in-a-lifetime opportunity to shine and shimmer under the lights, he showed up in a big way on college football’s center stage in the ’95 Orange Bowl. Sometimes life can be distilled down into one action, one choice, one grand, defining glimpse of grasping for that brass ring, and Mark’s high time was a Miami end zone where anxieties flowed and hopes ebbed. 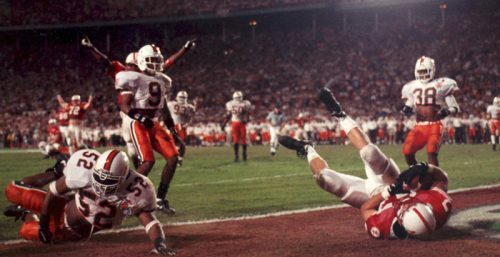 Clutching immortality in his lurching fall across a Miami goal line, his catch of a second quarter Brook Berringer 19 yard pass served notice that something was in the air that night, and a pantheon of Husker stars were born. Let’s hear from the former captain now: tight end Mark Gilman, a man living life with no regrets. Question: Hey Mark, so you’re back in Montana. What are you doing? Mark Gilman: I’m in IT right now. Information Technology as the Manager of Software Quality Assurance. My company works for the National Flood Insurance Program and we service the government with their flood insurance, so I manage a team of seven people and whenever we make changes to our system in any way we test it to make sure when it goes live to our thousands of clients that they don’t have any issues or problems doing business. For six years previous I worked as an insurance agent in Hastings, Nebraska, and I think one of the natural transitions that we’ll probably talk about here, as far as the lessons learned, is how you can translate playing into the business world. And especially sales, because you might find a lot of the ex-players are in sales. That’s what I’m doing now. Q: So you’re married with children. Where did you meet your wife? Q: What was she doing on the field after practice? Q: She made a ‘love connection,’ huh? Now, how in the heck did you end up in Lincoln, Nebraska? MG: This is an interesting story. As you know, schools would assign certain areas of the country to certain coaches to phone and recruit. Well, Dan Young was at that time a kickers coach and did some special teams coaching and also helped on the offensive line. He was quite a character and was assigned to certain states, and one of those states was the state of Montana. And what he would do, recruiting in the state like Montana, he would just create a contact in these rural states like Montana, North Dakota, etc., and the contact he had here was a head coach in Great Falls, Montana by -I believe- the name is Joe Johnson (who’s still coaching, by the way). He’s a well-respected coach who has an unbelievable won/loss record and a lot of state championships. Anyway, he went to Colorado all four years. He started out with the starting position and he lost the starting position all four years… and we kicked the crap out of him. (laughs) So that’s how I was recruited. And Osborne actually came to my house on one occasion. And the other thing is, I kind of thought it was an omen, because I was kind of getting recruited by a lot of schools -and more heavily in basketball at first, because I was a very good basketball player- and what sold it for me was when Coach Ron Brown came up and he watched me, in person, play basketball. And in that game I had probably one of the best games of my high school career. And after the game, that’s when they made the scholarship offer to me. I just figured everything kind of fell together there, and I thought it was ironic that Coach Brown came. I had an unbelievable game and that’s when Coach Brown offered me the full ride. Osborne came up after that and reiterated the full ride. And you know what, how do you say ‘no’? Q: Who else was recruiting you? MG: At the time it was the Washington Huskies and Washington State, Oregon was starting to heat up a little bit, and Wyoming was very aggressive. And then, of course, the smaller Montana schools were all over me and things like that. But Nebraska, after taking the recruiting trip there, some of the things they were doing, you couldn’t say no to them at the time. Q: Was there one overriding item that put Husker Football over the top? And you have to understand, we actually had a couple of people who grew up in Nebraska and lived up here in Kalispell, Montana, believe it or not, so I’d become familiar with Tom Osborne and the way he was looked at, how he was perceived and respected. And all of a sudden here’s the guy offering me a scholarship and saying, “Come on down here and let’s go do this.” That’s pretty impressive. At the time I was being recruited by those other schools -and Washington was impressive- but still, something about Nebraska just felt right. It felt right. And then Ron Brown, also. I could tell right away. 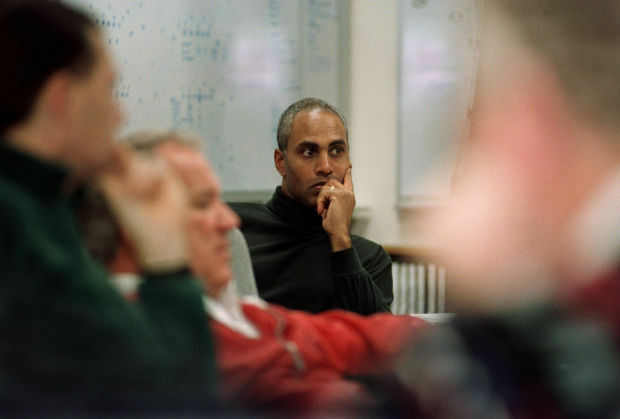 I could tell right away Ron Brown was going to get a lot out of me just by the way that he spoke, by the way that he conducted himself, his demeanor. And I knew that was someone who I could play for, because he was the guy who was going to be my position coach. And that sealed the deal, because I remember Boyd Epley brought me up and he got this computer program out and he said, “Alright, here’s how big you are now and here’s what we’re going to do to you: you’re gonna weigh 255 and you’re going to run a 4.4…” I was all excited. 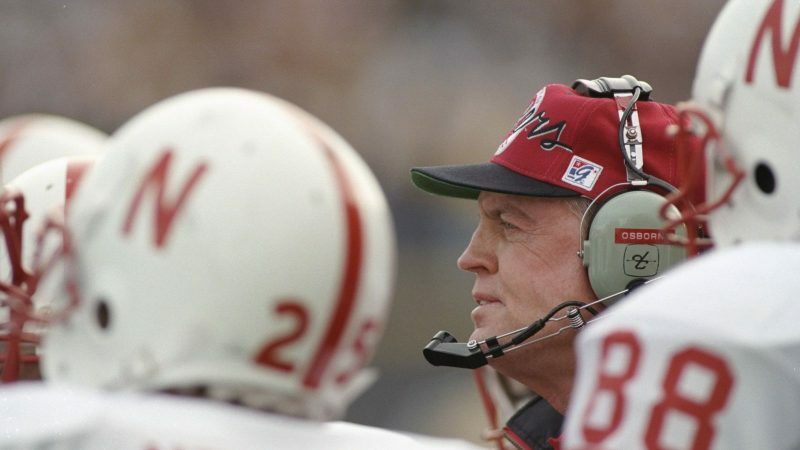 So that was kind of one of my adolescent things, “Oh boy, I can’t wait to be that big and fast.” But mostly, how can you say no to Tom Osborne? Q: Did your parents come with you on the recruiting trip? Q: How far is Kalispell from Great Falls? Q: So you came from some mountain state roots and a hardiness to harsh weather. 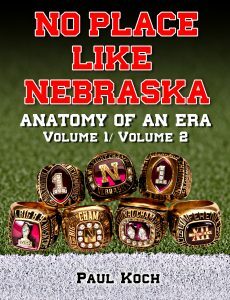 Did you sense anything different or peculiar in the Nebraska people, the fans, upon entering the University? MG: That’s a good question. I didn’t see a lot of differences. The mentality of people? It’s just knowing the value of hard work. Montana is Montana, and I want to classify them correctly: I want to say they are hard-working folks. We’ve still got the farms up here -we have the office buildings, too- but the bottom line is, we’ve got people up here who believe in working hard. But going to Nebraska and seeing the transition to the people and the personalities and their beliefs, there wasn’t a lot of difference. I love Nebraska people -especially in the smaller towns- who are just hard-working folk who put in a tough day of work and know the meaning of ‘work ethic.’ I see a lot of similarities between Montana and Nebraska, I really do. MG: My father was a teacher and coach. He coached all sports and taught history, education and health, and my mother was an English teacher, so I got a lot of the coaching directly from my dad and a lot of the psychological preparation to be the best. I was very fortunate, and the most fortunate thing was that I grew up a block from where my dad worked, so I had a key to that gym. Q: You were a gym rat! MG: I swear to this day that’s where I developed my athletic ability. I swear going down to that gym and shooting baskets and playing basketball every day, it was the key to all athletic successes. Q: A key much like Nebraska’s success: repetition, repetition, repetition? MG: Exactly. Over and over again. Exactly. Q: So it wasn’t a huge culture shock from an athletic or a personal standpoint to make the move to Lincoln? MG: No, no. Not much of a culture shock at all. 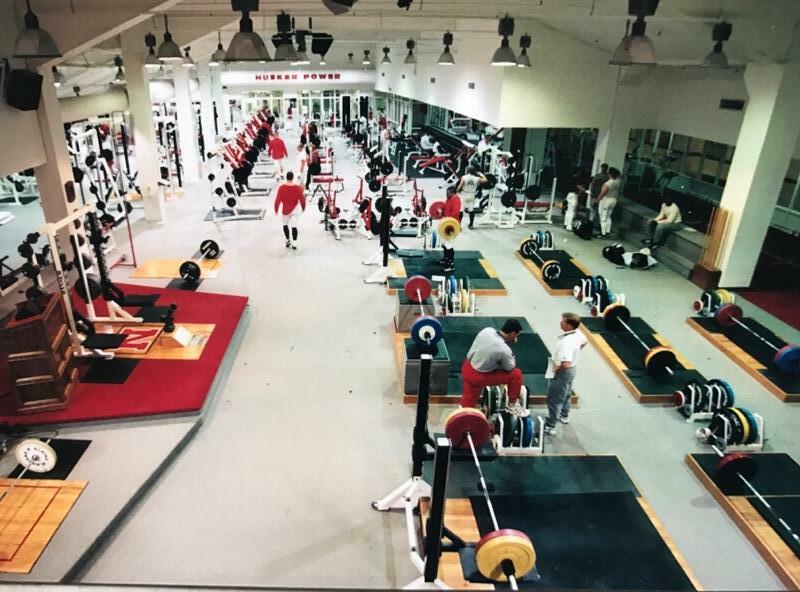 Q: So you stepped onto campus and two-a-days started. Was there anything about the organization that stood out to you? MG: I’ve got to tell you, it was a transition for me. 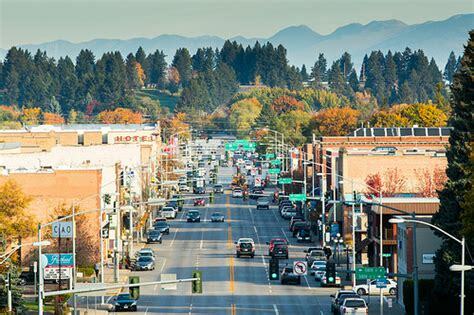 One of the bad things about growing up in Kalispell, Montana was that I was a big fish in a small pond, and all of a sudden I’m a small fish in big pond. And the big pond was the Nebraska football program. Q: When was your first fall there? Q: So you probably had Will Washington, Johnny Mitchell, Chris Garrett around as the upperclassmen. Were those guys around? MG: Those were the guys, and Darryl Leise from Creighton Prep. And Johnny Mitchell, wow! Q: What about Coach Brown’s methods, philosophy? MG: Here is Coach Brown to a ‘T’: it didn’t matter if it was Monday practice or sixty minutes before the national championship game versus Miami or Florida, he was intense. And it was constant, continuous improvement and challenging us at every moment to be better and to feel the pressure and intensity that it takes to be a champion at all times. I would walk out of Monday meetings ready to take on the world. And that was Coach Ron Brown. And for the five years I was there -because I redshirted- he never let up. Never! And that’s what I tell people all the time about him. There was no difference between him on a Monday in the middle of the season and that freaking championship game; that guy was ready to rock. Q: And he probably could have played if you let him? MG: He probably could have played a little bit. He was intense. One of the things, too, what I liked about that -he would put the pressure on you and the intensity on you and the sense of urgency. And that was the phrase that he used, if I recall, ‘Sense of urgency.’ And when it came to game time you wouldn’t melt under pressure. Because, you know, it’s real easy to take it easy all week and philosophize, but he was, “Hey guys, let’s go out and get them today. There are 76,000 fans screaming and you’re down by a touchdown and you have twenty seconds left…” He prepared you for that so you were mentally ready for those situations where there was pressure. He was constant with it. I do a lot of volunteer coaching and I’ve taken Coach Ron Brown’s philosophy. I try to put enough sense of urgency into my son during the practice to where the game becomes easy, like a break. Q: How do you find yourself actually doing that? Q: Exactly. So who did you have to deal with most of those practice sessions? MG: The rush ends on a daily basis: Trev Alberts, Grant Wistrom, Jared Tomich, Michael Rucker, Travis Hill my first year. Donta Jones. Dwayne-freaking-Harris. This kid scared me. He still scares me. These are the guys I’m dealing with on a daily basis, one-on-one. And after a while they knew our offense, so they didn’t even give a crap and just came full speed. (laughs) Luther Hardin? I mean the list goes on and on, man. Q: Coach Osborne, did you have any particularly unique interactions with him? MG: Coach Osborne, you have your biological father and then you probably have some men who you meet along your life who have a fatherly influence on you, as far as teaching you life lessons. My own father, and then you had Ron Brown, and Coach Osborne would have to have been number three. You learned more. I think Osborne’s real famous for emphasizing more than just football: it was academics, your spiritual life, doing things the right way, emphasizing life after football. He emphasized how to act on the field, off the field. He wasn’t just all about the x’s and o’s and about football and, “Hey, we’ve got to beat Colorado this week.” That’s the thing about Osborne that was very interesting: just like Ron Brown pushing that sense of urgency, Osborne was almost the exact opposite and had a calming effect, an even-keeled demeanor, but oozing with confidence, you know what I mean? That’s what I liked about Osborne. Here’s a guy who didn’t have to yell, didn’t have to jump up and down, but you could tell this guy knew what he was doing. When he said something you knew it meant something, it was just amazing. You think of a lot of football coaches and they’re fire & brimstone, “Football’s going to war, man!” And ol’ Osborne, before games he’d go through special teams just to remind us on punt team, kickoff team, he’d always say, “You are going to play well today.” I remember, that’s always one of those things that stands out. He was, “You are prepared and you will play well.“ And that meant a ton. And he would say it with such confidence. Basically, what he was saying was, “You are ready. You are ready and you are prepared.” And one of the things that helped him was that he had already had his legacy established by the time I was there (because new coaches have to establish a legacy with the way that they are, because you could be an easy-going guy like Coach but not have much of a winning record and people won’t think much of you). 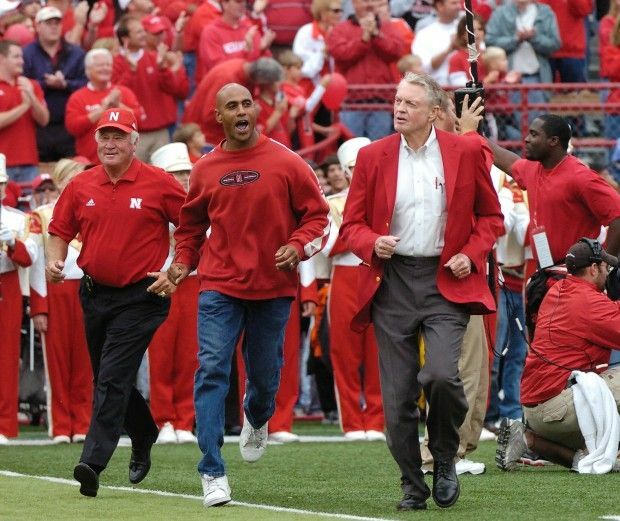 But with his legacy, when a guy like Tom Osborne says, “Men, you are prepared for anything they throw at you. You will be able to counter whatever they throw at you. You are going to play well,” that means a lot. Q: He was planting positive little seeds of proficiency in your heads, huh?